Cyberscience will be different from traditional science. For two decades already, the scholarly community has witnessed a considerable increase in the use of information and communication technologies (ICT). As opposed to "traditional" science that does without networked computers, the notion of "cyberscience" captures the use of these ICT-based applications and services for scientific purposes. The basic assumption of this study is that ICT use impacts on the basic parameters of how academia is organised, of how it functions, and of what it produces. 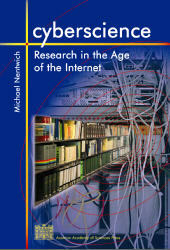 This book describes and analyses the use of ICT in the academic world; it explains the status quo based on an analytical model; it draws a realistic and differentiated picture of probable future developments; it assesses the impact of ICT on various aspects of academic activity and on the substance of research; and it discusses the implications for research policy and the steering mechanisms within scholarly organisations. The overall conclusion is that we are in midstream of a forceful development. Cyberscience is already taking place, but will only develop its full shape and potential later. The new media have only just begun to play a central role in a large array of scholarly activities, and in regard to the institutional setting. Not only academic communication in the narrow sense, but also the distribution of knowledge and, most importantly, even knowledge production are affected. Hence, the impact of ICT can hardly be underrated.